Vejer celebrates a new edition of the Sunshine Tour in 2012, a great international equestrian show jump and dressage event. 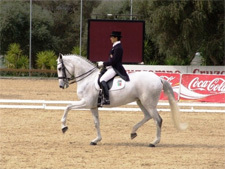 From the 31st of January to the 25th of March 2012, the prestigious Centro Hípico Montenmedio will welcome the best riders in the world for three star jump and dressage tests for the new edition of the Sunshine Tour, the Circuito Hípico del Sol. About 1,500 horses will take part in this great event, which is considered as the greatest Winter Contest in Europe that attracts yearly about 10,000 professionals of the equestrian circuit. This great event always attracts thousands of horse enthusiasts. El Paso Hotel is the closest one to the riding centre where the event will take place.